.....silent interpretation of a screaming reality! Welcome to the Art Gallery for Radical Deep Thinkers and Non-Conformists! This site features the graphic and oftentimes radical, original artwork and drawings of artist Steve Goins. 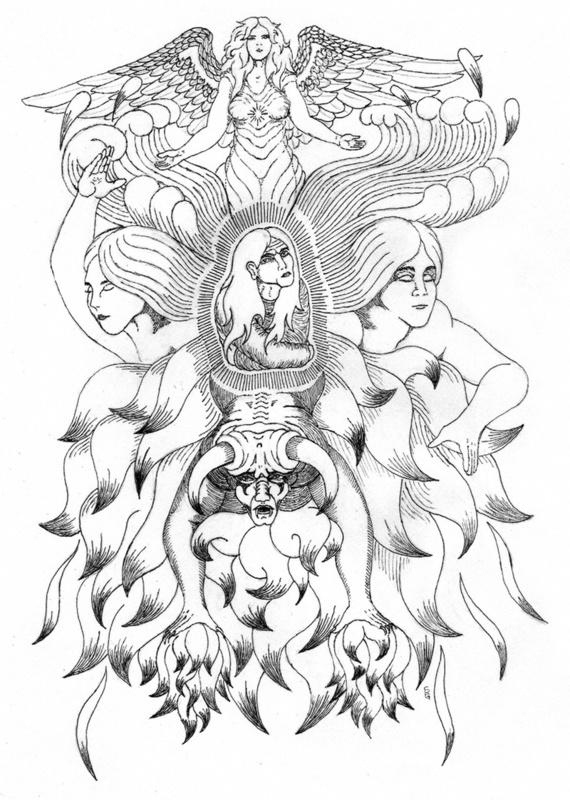 His drawings center around symbology, and are his personal interpretations of the spirit and psyche of the human condition. Steve's life path did not lead him to be formally or traditionally trained in the arts. He uses his gift of insight and natural artistic ability to depict the deepest, unspeakable truths and hidden depths in each of us. All the artwork presented here is copyrighted. You are invited to enjoy it, but asked not to copy or use it in any way without express permission of the artist. 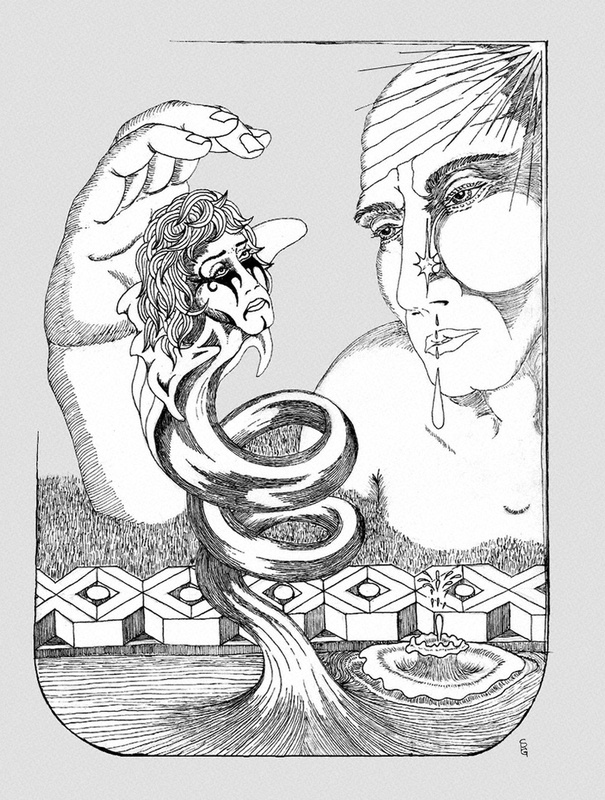 In the rendering of "Duality", the opposing sides of the psyche are presented. 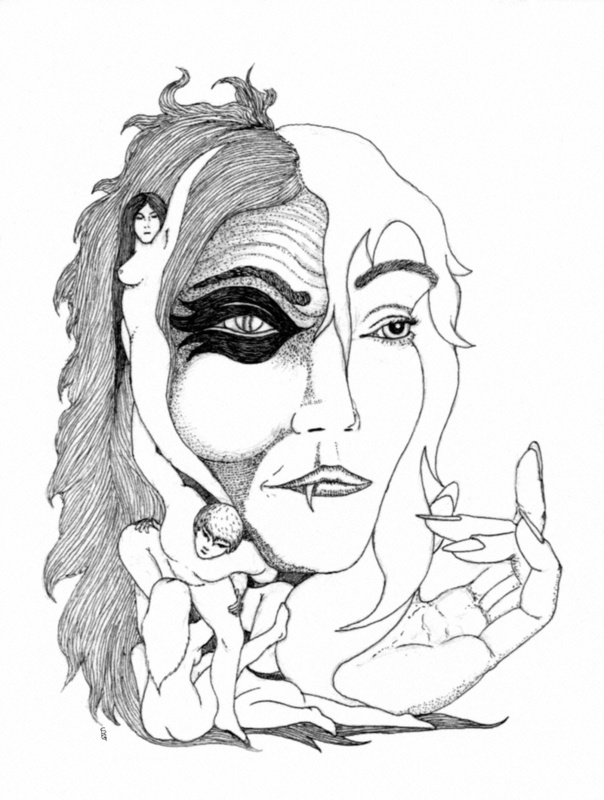 The Crone is presented on the left representing the hidden darker side, and the Innocent on the right, representing the exposed side of light. The small human figures emerging from the core of the being (or soul), alternating male and female, represent the perpetual inner struggle of the spirit to manifest the one and suppress the other. The imagery in "Inner Reflection" is powerful and deeply moving. The title implies a voyeuristic glimpse into the mind of the artist at the time of the rendering. The physical presentation of the main character suggests a tender reflection and weary resignation of a life's dream perhaps. It's also possibly the bitter-sweet last farewell to youth and the passing of the age of immortality and endless possibilities to the more mundane existence of everyday life filled with the disappointments of unmet expectations. So what is the artist saying here? The clue is in the title "Contemplation". The angel's right wing is clipped, and his right hand is held behind his back. He holds a vessel in his left hand with what looks like a sad little plant struggling to survive. 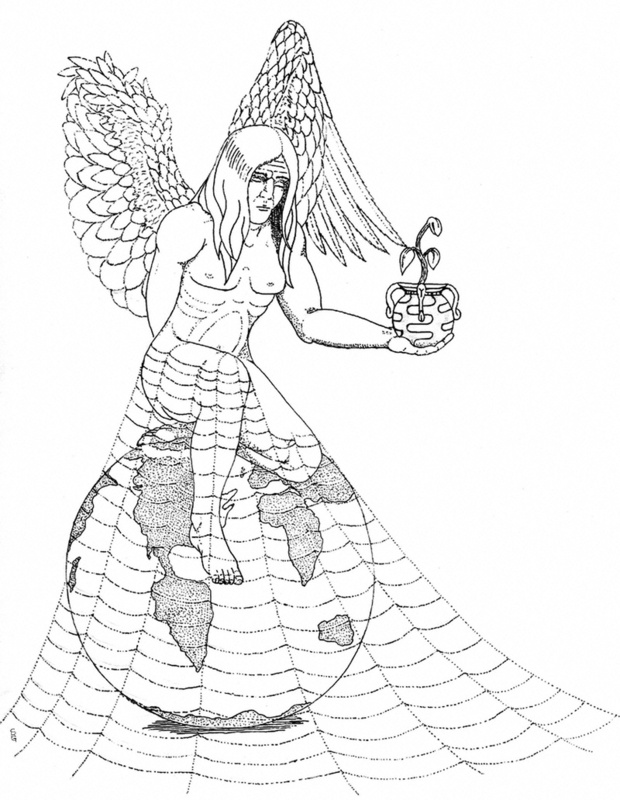 The cobwebs draping from the angel's lower body over the earth implies stagnation.